Call me crazy but this past weekend I had a sudden urge to complete a stadium workout. I was toying around with many different ideas until I came up with this workout. A couple of my friends and I completed this workout yesterday after school. It was a great workout and running up the stairs on the side of your leg was a killer. I woke up feeling great this morning and plan on doing more workouts like these in the future. The feeling may have also been from a fabulous dinner last night with friends. For the past two Tuesdays my friends and I have had pot luck dinners and grilled out at each others houses. Everyone has been contributing somethings and it’s been a perfect way to enjoy a Tuesday evening. Last nights dinner was especially delicious. I was so excited about the dinner that I completely forgot to take a picture of it before I started. This is the best picture I could salvage from having already gone to town on my dinner. 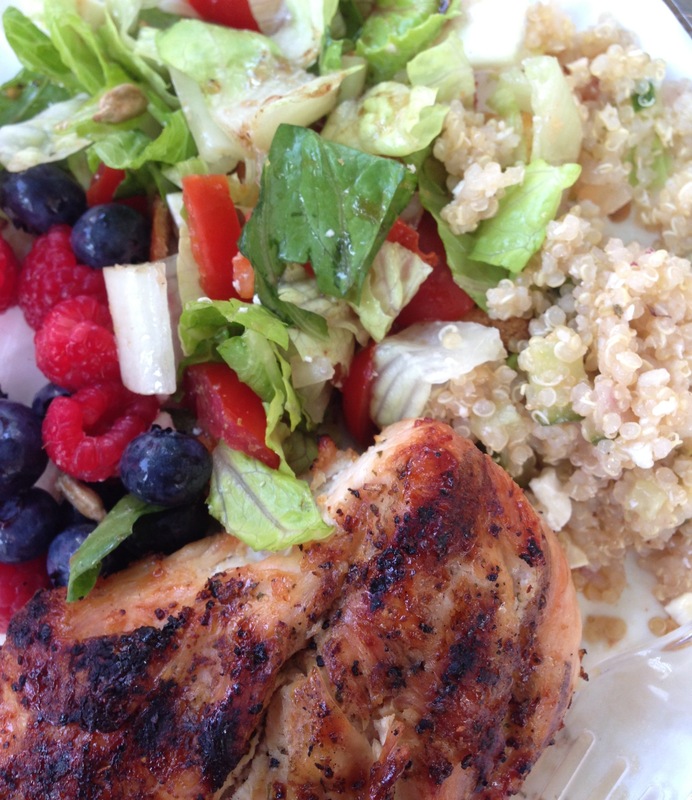 The dinner included grilled chicken, fruit salad, a veggie salad, and Greek quinoa salad. So many salad variations and each one was on point. It was all delicious and a perfect summer dinner. Plus we had cookies for dessert.